Football season is — gulp — drawing to a close. 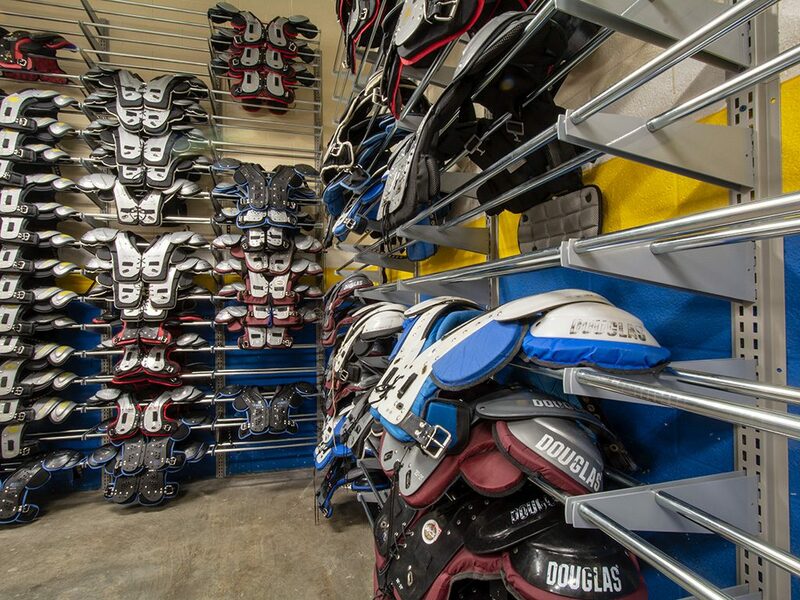 While fans switch their attention to March Madness hopes, many athletics facility and equipment managers will embrace the downtime to rethink gear, jerseys, and helmet storage. 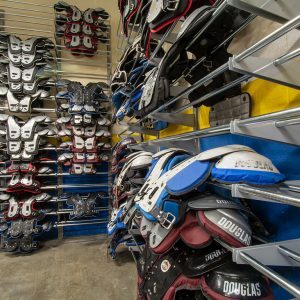 Keep these sports equipment storage examples in mind to get better organized in the off-season. 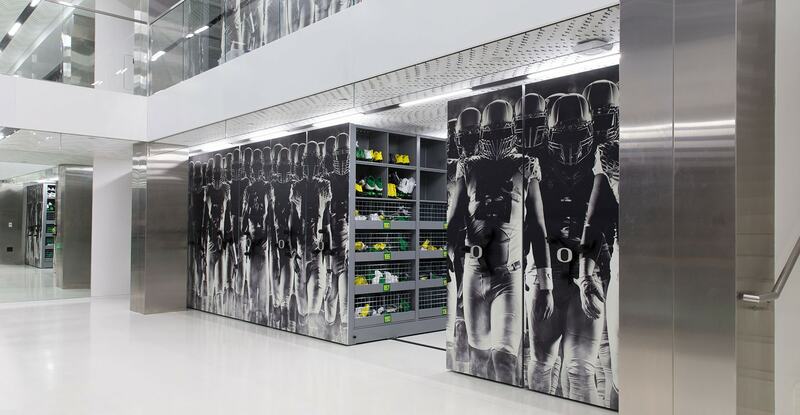 Football storage lockers have their own specific requirements. There’s a need for wide span shelving, bin dividers, boxes and totes, hanging rods, and locking drawers all in the same space. 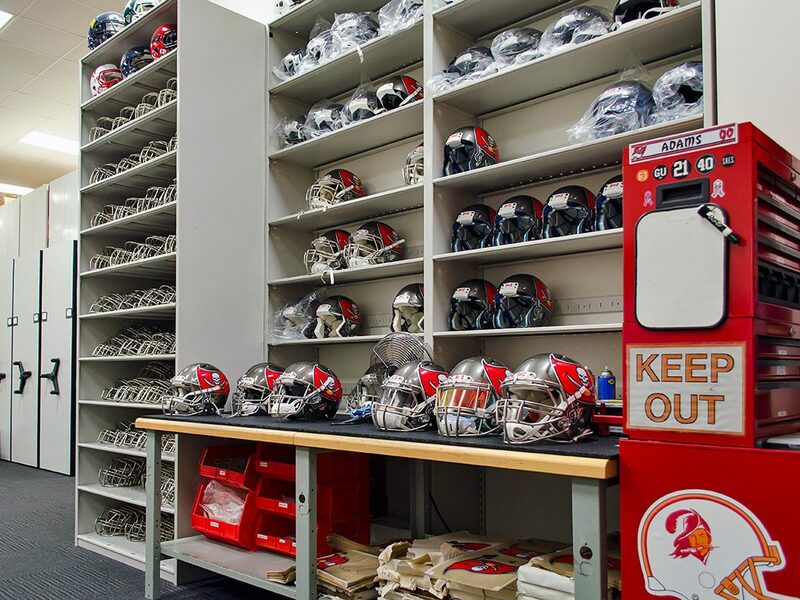 Without this variety of components, its more challenging for equipment managers and their staff to hold the shoulder pads, display jerseys, keep helmets clean and drying while also tracking all the little moving pieces such as chin straps and mouth guards. 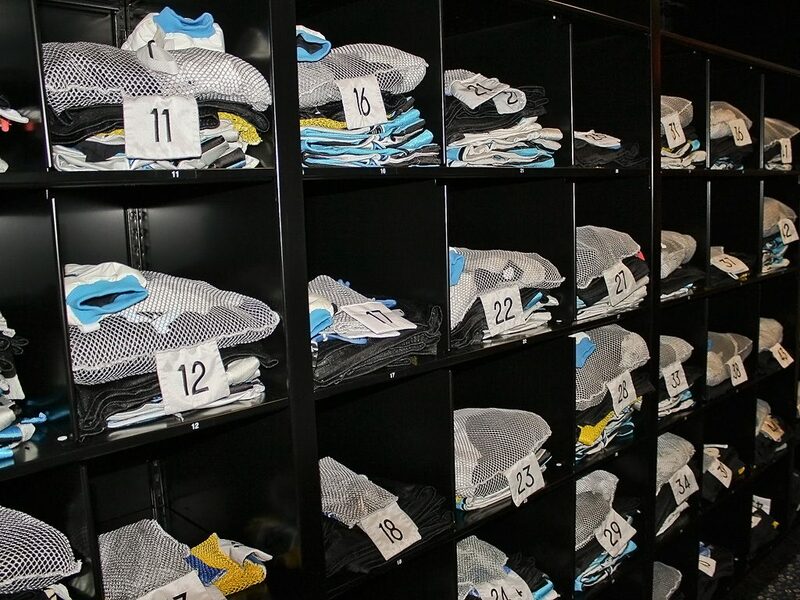 A revamp of the Carolina Panthers’ equipment room is a favorite design of our Manager of Project Planning – Mike Hisman. 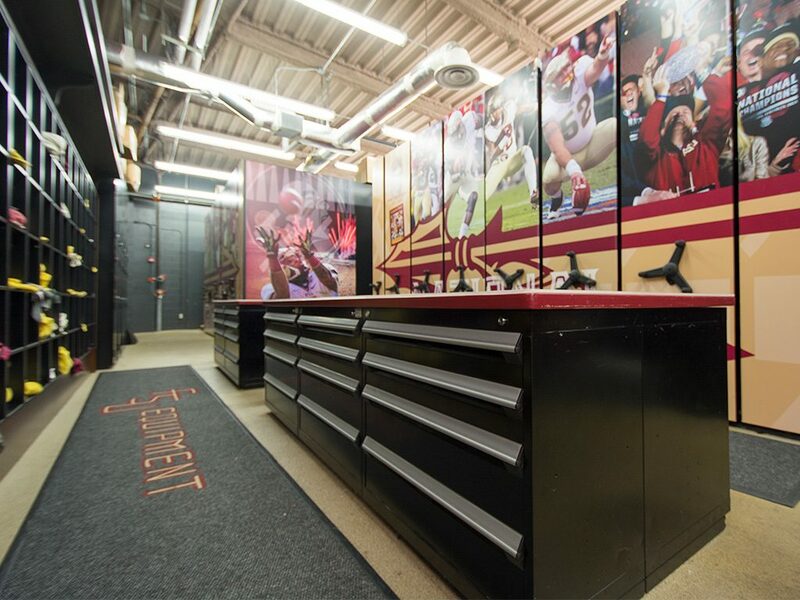 The Charlotte, North Carolina-based team took advantage of the off season a few years ago to renovate its Bank of America Stadium equipment room. 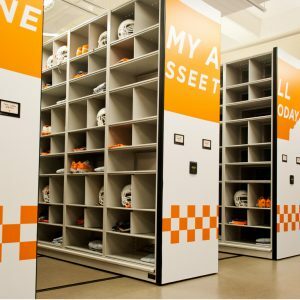 They added High Density Mobile Storage Systems, Static Shelving and Modular Drawer Cabinets to store everything from helmets, uniforms and shoes to hats, sweat suits and shoulder pads. 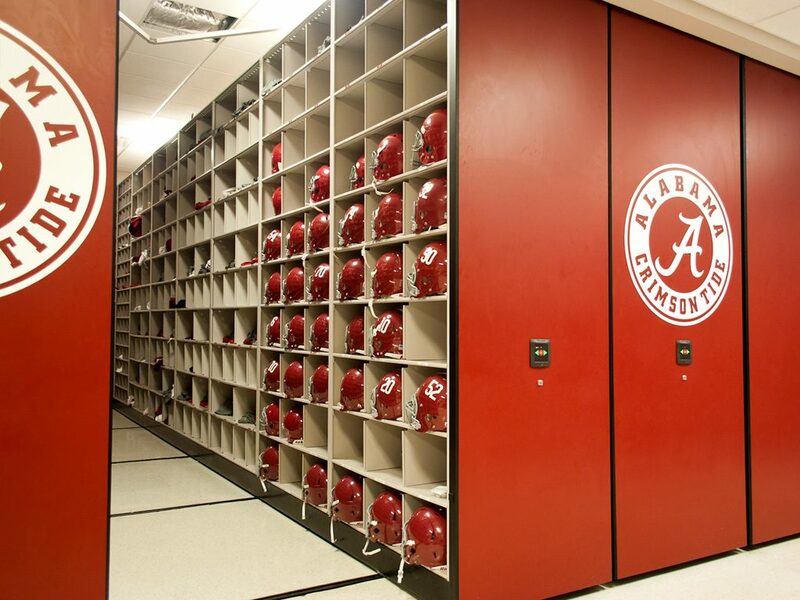 “We probably increased our space by 100 percent,” said equipment manager Jackie Miles. 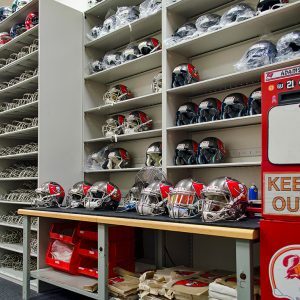 Pro teams Jacksonville Jaguars, Tampa Bay Buccaneers and Tennessee Titans (just to name a few) have also turned to our storage planning pros. 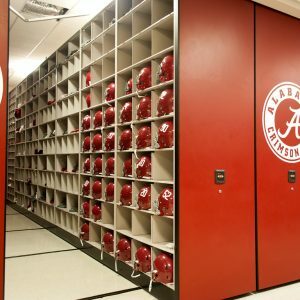 At the college level, sports equipment storage solutions have scored touchdowns at the likes of arch rivals Clemson University and Alabama, as well as The University of Tennessee and Ohio State. 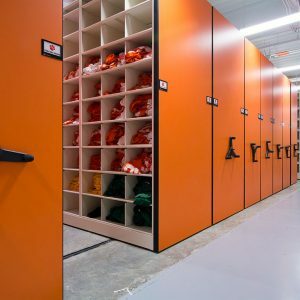 With a donor providing funds for an equipment storage update at Florida State University, for example, Patterson Pope was able to provide high-density shelving systems with individual player cubbies inside and 35% more storage. Adding hip-high work tables with shallow drawers also created a repair workspace. 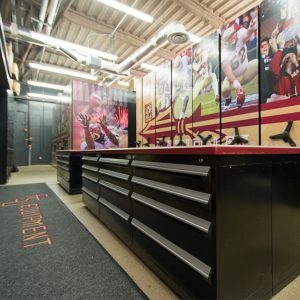 But, it’s the immediate impact of the FSU Seminoles logo and action graphic design applied to the storage design that adds drama. 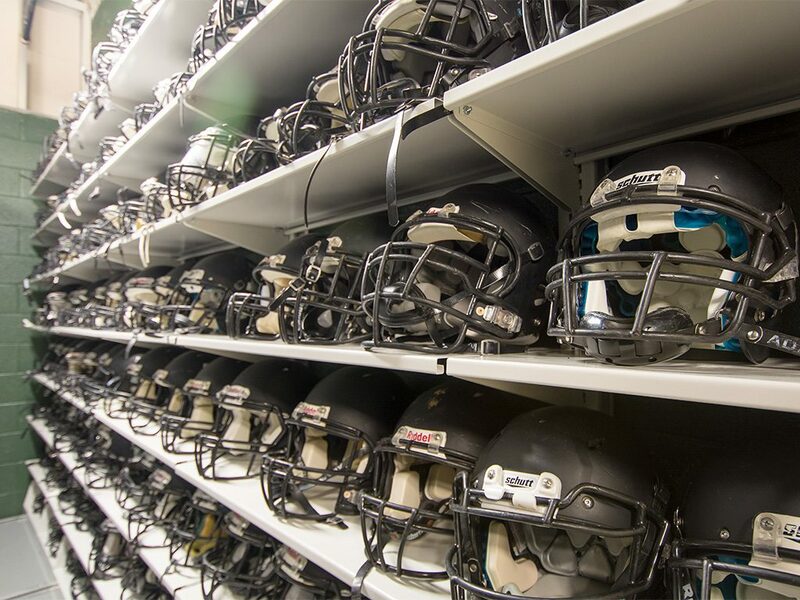 The Demon Deacons of Wake Forest keep equipment for 12 different sports in the same room using six moveable — and lockable — high-density manual assist mobile shelving units. 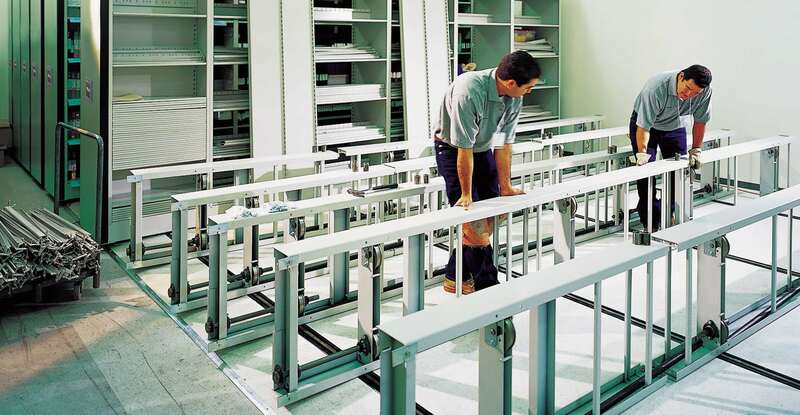 In fact, the storage solution takes up only 20% of the 5,000 square-foot space. The right athletic storage can also make the highlight reel at the high school and community sports level. 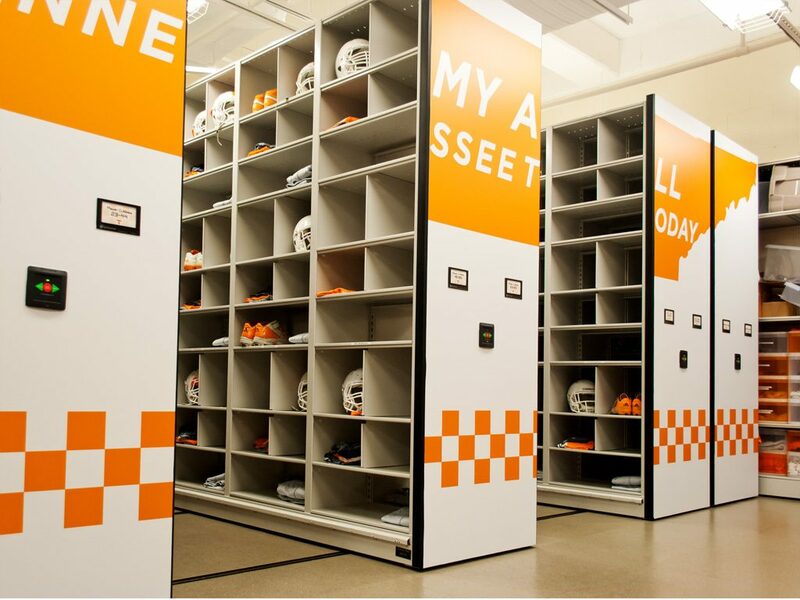 For Nashville’s Brentwood High School, Patterson Pope customized static shelving, cantilever shelving and oblique shoulder pad storage to optimize the nearly 200 square feet available for equipment storage. 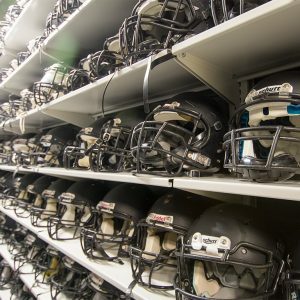 At Kennesaw Mountain High School in Cobb County, Georgia, the equipment room meets the needs of five separate football teams. 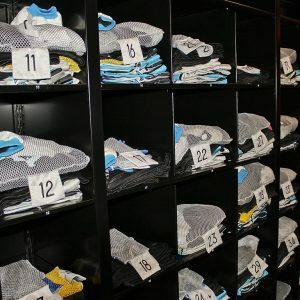 We knew that taking care of the equipment was something we had to do better,” said Devan Seabaugh, the president of the football boosters’ club. The school selected a Spacesaver High-Density Mobile Storage System and adjustable shelving to create a designated spot for every single piece of equipment. “Now, we not only know exactly where everything is but it’s a lot easier to get to, and that’s a big deal,” said Varsity Head Football Coach Andy Scott. 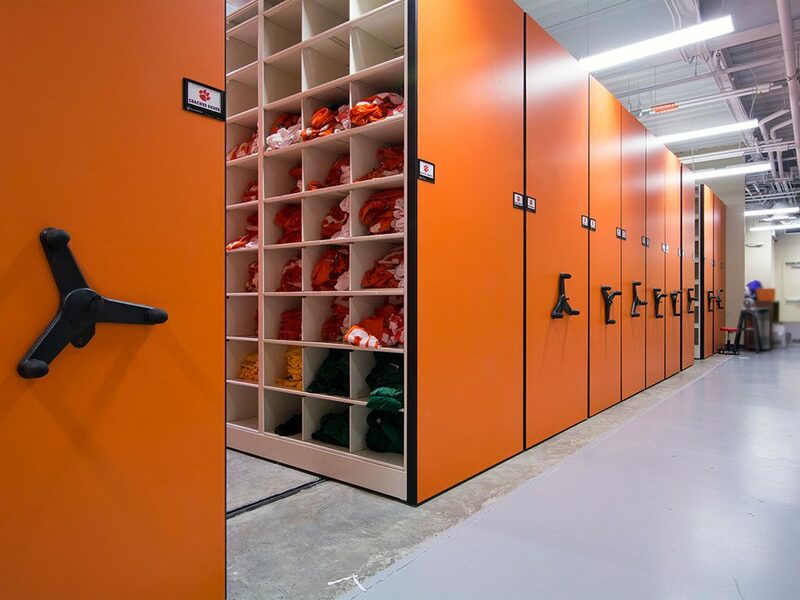 Although this article has focused on American football examples, Patterson Pope has deep experience strategizing athletic equipment storage solutions for all kinds of sports. 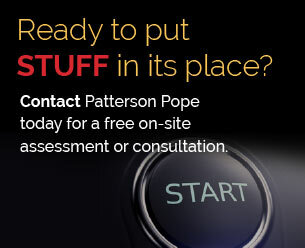 Find out more about the efficiency, easy retrieval and space savings the right customization can offer your team.